Using builder bags in public spaces? A permit is always needed and bags may never be placed on sidewalks. Builder bags must be placed so that they do not obstruct pedestrians and other passers by on sidewalks. To place a bag in a public space you also need a permit from the police. 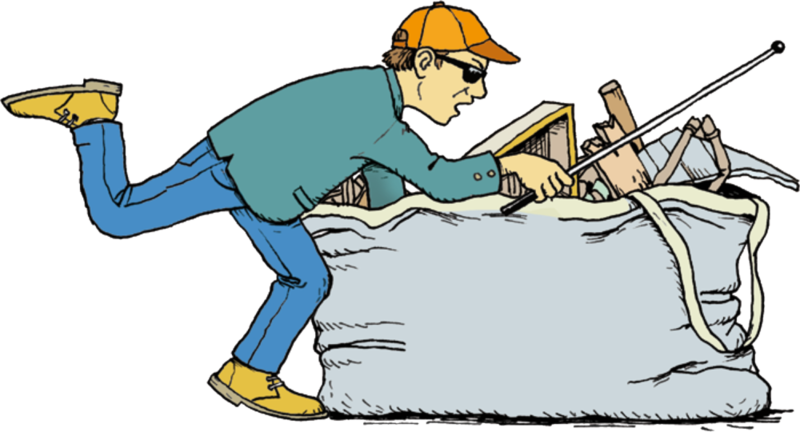 If you have already placed a builder bag in a public space without a permit make sure to get it picked up and removed as soon as possible! And for the next one make sure to get a permit and place it in a correct way. On the side walk builder bags obstructs the free passage of pedestrians. This is especially problematic for people with disabilities, but also for emergency personel, street cleaners and others. Accessibility for all is important. Bags are often filled with heavy and sharp objects that might cause damage to both clothes, people and pets. Make sure that all material you put in the bag fits well inside the bag and do not stick or fall out. Using a bag with a lid is a good idea to minimise this risk. If a bag is left out too long it will often be filled with other types of garbage, not seldom house hold garbage, food and food packaging. This does not only look bad it also attracts pests and vermin of different kinds. To place anything, for example a builder bag, in a public space you need a permit. Even with a permit you are not allowed to place bags anywhere, and basically never on the sidewalk. Please contact the police to start the permit process. This web page has an explanation in English. You can also read more about builder bags and how to place them correctly on the City of Stockholm web page. This page has more info on placement of builder bags. At the top right corner you can press “Languages” to get the page google translated. Usually info about how to get your builder bag picked up is written on the bag itself. If you do not know where to turn for removal of your bag you can use one of these companies.